Australia produced plenty of electronics for Sonic & accessories that seem exclusive to the area. This includes mainly modern things like special Wii accessories, portable system accessories, cases & more. 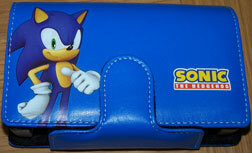 Where's best to keep your Sonic DS games? 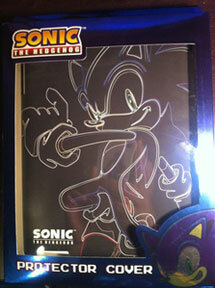 Why, in a Sonic themed case, of course! 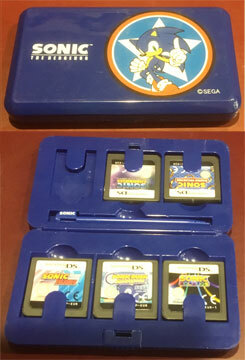 This all blue case fits the bill with the modern logo on the top & Sonic in a star on the lid. Inside, it has room for 6 game cartridges & a spare stylus for your DS. Other than the lid graphics, the case is a plain navy blue color. Here's an ad for the Sonic Classic Collection on the Nintendo DS. It's the collectors limited edition, & comes in a metal tin you see here. 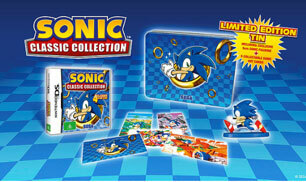 You also get inside the tin several colorful cards (5), the regular game in its plastic box & a classic running Sonic figure on a little blue base. Interestingly, the tin itself is quite modern-themed, with jumping twist Sonic in a gold ring & other CG gold rings flying out of the blue checkered background. It's a nice pre-order(?) bonus item, or just collectible version of the game that comes with enough cool stuff to incentivize. Wow, a Wii yoga mat! The Wii Step Balance Board came with a game Wii Fit that has exercises you can do, as guided by the weight sensor in the wii board. Some of the yoga poses though, should be used on a yoga mat, because you have to lie down on the floor. 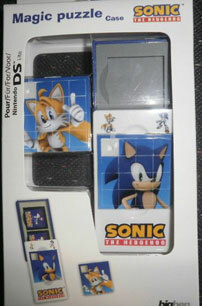 This DS Lite Case is called the "Magic Puzzle Case", however, what it really is, is a 'sliding blocks puzzle'. There are 2 different 15-square puzzles built right into the exterior of this case. One with a CG Sonic portrait, the other with a CG Tails portrait. This type of puzzle has 1 blank square. You slide the pieces around, trying to arrange the image back to its original state, by only being able to move 1 block at a time. The case itself appears to be gray plastic.